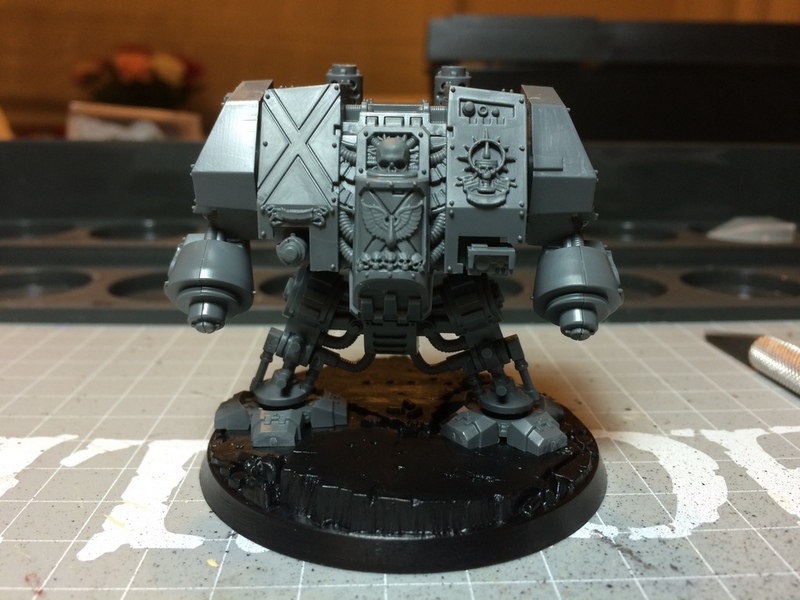 As the above photo suggests I’ve been putting together the Death Company Dreadnought that comes out of the Deathstorm set and I find it to be a blast really to clean up and assemble. No wonder the loyalist scum pick these models by the dozen. I missed the cutting and cleaning on the models, I guess this will give me the necessary will to jump to painting other models, right when I get ample time for a nice session. It was a very close call on the selection of the chassis between Death Company and Furioso Dreadnought. Decided to go Death Company by a very small margin. The first few sessions were quite fruitful, not much to build up now except for some details on the chassis and the claws. Of course, there are some join lines that need attention too. Contrary to my past posts, I’m leaving out the steps I took in assembly to save them for an assembly tutorial via Prezi, the tool I mentioned last week. Needless to say, stay tuned for a zooming action on how to properly assemble and save yourself some hassle during cleanup in the coming weeks. The past Saturday we hosted a little get together for my friends from high school and we got a chance to both blow off some steam from the past week and just to have some plain old fun with unusual board games. After a few rounds of Saboteur, a card game based on bluffing and maze building, we jumped into Relic, another Fantasy Flight Games board game taking place in the Warhammer 40k universe that pits the players on a race to reach the center of a board filled with the usual hazards you’d encounter in “the grim darkness of the far future”. The first few rounds after setup went a little slow but we picked up the pace as we went along. …which in turn results in my delight in his plight! Fitting for a true agent of Chaos, don’t you think? Xasf of the Mechanicum is on a roll… which served him well for the endgame. The game is based on a combination of a card and dice mechanics that allow the players to move through the tiers set on the board. The players level up as they progress to better shoulder the trials set closer to the center of the board and gain attributes that allow them to manage harder encounters at each turn. The game deserves a full review on its own (another thing on the to-do list I guess) so I will not delve too much into the details. 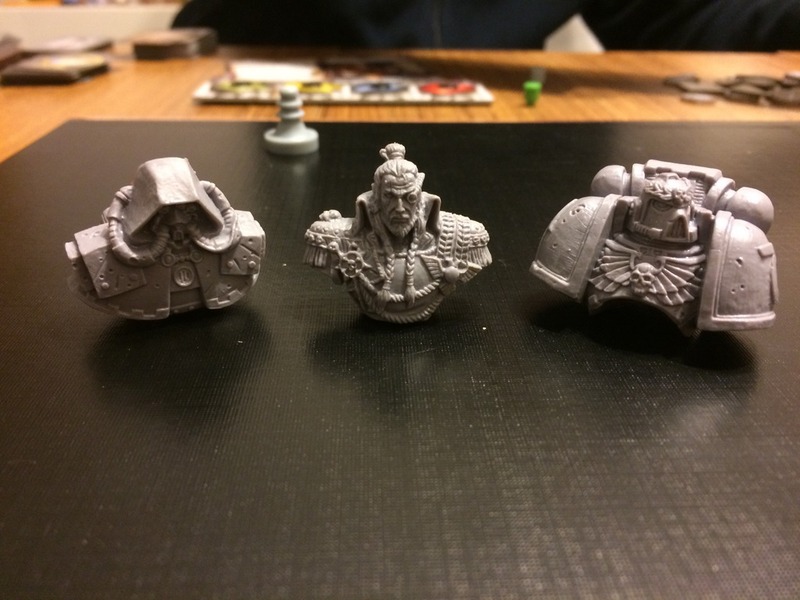 However I will mention one thing that got me interested a lot more than expected: the player tokens are actual busts of the characters and they’re beautifully detailed and yes, they’re begging for a cool paint job! Here’s the set of characters we used. From left to right, Xasf picked the Techpriest Enginseer, I opted for the Rogue Trader and Rewendor chose the Ultramarines Captain. Here’s the complete set of busts. They’re just gorgeous to behold with a TON of sculpted detail. 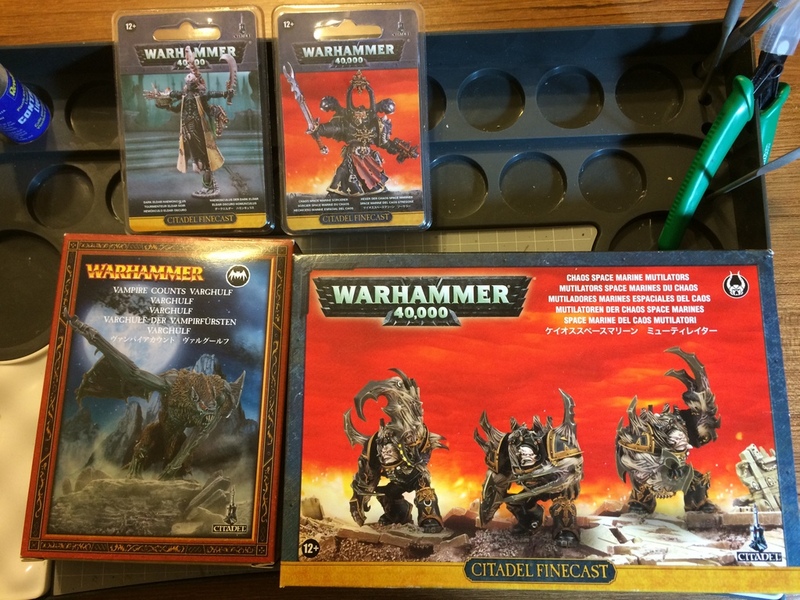 Can’t wait to get my hands on these for painting! A special thanks to Xasf here for thinking I’m talented enough to do them justice… let’s hope I won’t get carried away with all the models that are piling up! Lastly a shot of the remaining resin kits that I’m planning on preparing this week. Shorter sessions lend themselves well to clean-ups and knife work so I’ll hopefully get these ready along with the other models that need cleaning (Random Encounter, Obliterators and the metal Varghulf). Then I’ll need to shift my order of items in favor of the 54mm dwarf, since the deadline for submission is getting close! At least I’ll be eating away from the kit mountain. Ah, I love distractions. Don’t worry, I’ll get them all done in due time. Now I just have to define “due time”! Woah! 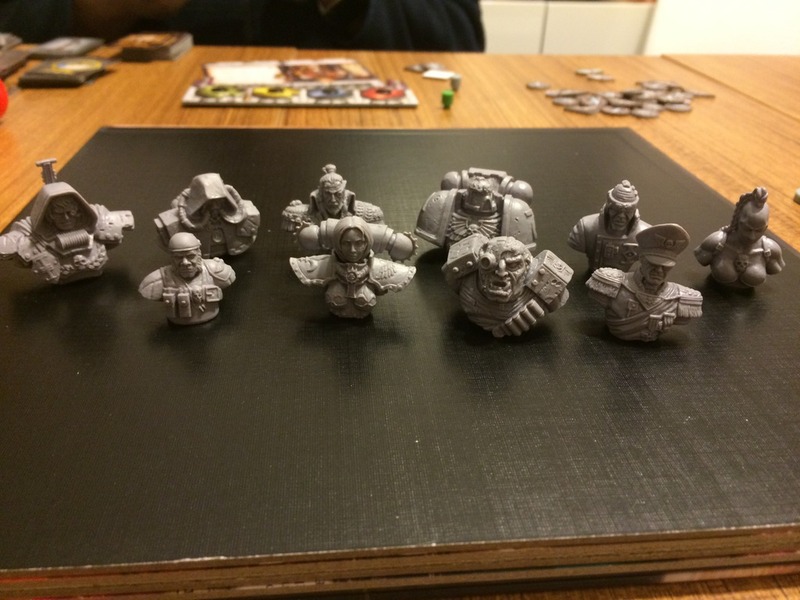 I had no idea this game has wicked cool busts…is that a sisters canoness???? Aside from the characters I mentioned and the one you have successfully pointed out, there’s a Ratling Sniper, a Commissar, a Callidus Assassin, an Ogryn, a Sanctioned Psyker and an Ordo Malleus Inquisitor. I’ll leave it up to you to pinpoint which is which! Well looks like I am going to buy both :). Thanks roemer, this is awesome! Totally ordered it. Honestly for the price…it’s worth it just for the busts. They’d sell those guys for 20 bucks a pop individually I bet! Excited to finally have some busts to paint! I’m glad you like the busts. As you said, they’re worth their weight when painted nicely, and could very well cover the costs of the game itself. Looking forward to your progress with the minis and the game itself too. Who knows, you may be able to pull off a review before I publish anything on my space! As for integration into the game, These characters are the “nemesis” (nemeses?) -hence their hostile coloration- and they don’t follow the usual winding path into the middle space, instead they roam around the board trying to hunt Imperial players and make life even more grimdark than usual, and they have other victory conditions depending on those. Pretty neat actually. Okay, these are pretty kickass. I guess I have to step up my game with Space Hulk fast! And hey, thanks for the reference pictures. Even though there are character sheets to look at, these are done so well they can be used on their own. Turns out Genco has Nemesis at Amazon prices (incl. shipping), I might just go ahead and put in an order for the next shipment! Next shipment huh… hopefully you’ll have it by summer! It’s a WordPress thing I think. Count me in.